The Martin J. Whitman School of Management has earned a #20 ranking on the Princeton Review’s new list naming the top 25 online M.B.A. programs for 2017. This is the second year in a row the school has been listed in the top 20.The list is the first ranking of online M.B.A. programs that is based on both surveys of administrators at the schools and of students enrolled in the schools’ online M.B.A. programs. The Princeton Review chose the schools for the list based on its surveys in 2016 of 90 institutions offering online M.B.A.s and of about 3,800 students enrolled in the online M.B.A.s, plus graduates of the online programs. Data points were weighted in more than 60 unique fields to tally the final list. Criteria focused on five areas: academics, selectivity, faculty, technical platforms and career outcomes. MBA@Syracuse is Whitman’s premier distance-learning, part-time program for professionals and executives. Relaunched in January 2015, in partnership with 2U, Inc., the online program includes live, weekly, face-to-face sessions taught by Whitman professors in small seminar-style classes. The immersive course content features highly produced videos, quizzes, learning modules and other interactive media. Additionally, faculty and students have access to the MBA@Syracuse online learning platform and coursework on mobile apps. MBA@Syracuse’s hybrid model allows students to develop collaborative relationships with faculty and peers while providing the flexibility to complete their M.B.A. as they continue their career progression. The program offers electives in accounting, finance, marketing management, supply chain management and entrepreneurship. MBA@Syracuse requires the completion of 54 credits, or roughly 18 courses in 11 week-long semesters, along with three in-person residencies in cities that are major centers of international business, as well as on the Syracuse University campus. 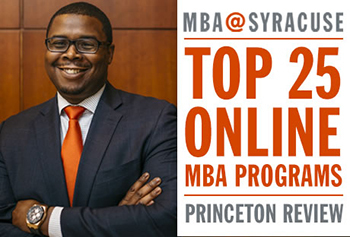 Admission for MBA@Syracuse is selective; applicants need a bachelor’s degree and at least one year of full-time professional experience. The GMAT is not required for applicants with more than five years of experience. Upcoming deadlines for admissions are Nov. 3, as well as Feb. 6, May 8 and Aug. 1, 2017. For more information, contact Whitman’s Graduate Programs office at 315.456.9912 or 1.844.SYR.4622, or visit http://onlinebusiness.syr.edu/mba/.